FastChrom is a complete Matlab-based method for baseline correction, peak detection, and assignment (grouping) of similar peaks across samples. The method is especially useful for single-channel data (e.g. GC-FID), but can also be applied on multi-channel data (e.g. 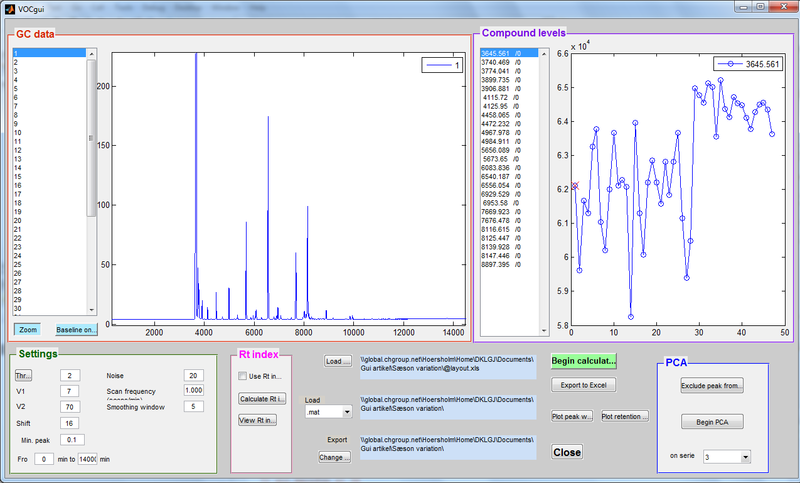 total ion chromatogram from GC-MS). The newly developed method for baseline correction uses parts of the chromatographic signal as baseline; therefore less noise is present in the baseline corrected signal compared to just subtracting a globally fitted polynomial. The incorporated peak detection method incorporated detects all peaks present in the chromatograms which fulfil the requirements set by the user, and there is no need for recalibration if shifts occur. In FastChrom peaks are grouped according to a maximal shift which can be set by the user. In the grouping step information about the density of peaks across samples are used in the positioning of the centre of the grouping windows. In addition FastChrom offers the possibility of applying a retention time index to the identified peak groups. The index will be unaffected by shifts in retention time. This possibility eases identification and comparison between different experiments. FastChrom is implemented in a graphical user interface and can therefore be used by people without programming skills.